A quick post today, which isn't really about technology (hmmm, do trading systems count?) but just something that I thought up this week which you might find interesting. After all, isn't a risk-free arbitrage the holy grail of investing? US politics is the world's greatest spectator sport. Big money, a year-round season and you never get lockups. Plus you get the final result in one night, rather than having to wait around for the finalists to slug it out for a seven-game series. That's the only way I can rationalise the fact that the US takes eighteen months and $6bn to arrive at essentially the same decision that the UK manages for $49m. Given there's no public benefit to be gained from an addition $5,951m of electoral friction cost (unless you are political lobbyist), it must be some hideous example of bread and circuses. But its a funny sport, because even though the season end is more than a month away, we already know the result. Barack Obama will be re-elected (probably by a shellacking) on 20th November. So how are you so sure? If you want to know why, you just to check the market. I've been an avid follower of the Iowa Electronic Markets for over ten years. Run by the University of Iowa, its one of the world's longest-running real-money prediction markets. They make markets (For purely research purposes of course!) in a select number of political events - largely US elections and nominations. So not vastly useful if you're a tech investor, but if you follow the soap opera of American politics its gripping stuff. And its amazingly ahead of the curve. In every US election I can remember its called the winner and called them early (2000, 2004 and 2008). In contested nominations too it showed Barack pulling away from Hillary and Romney sailing away from this year's field long before the Bubblevision experts would admit it. Partly this is actually psychological - if you're a journalist a) you don't want to risk being wrong and b) you want to string the story out as long as possible. In contrast for an investor being wrong's not a problem - as long as you're right more often than you're wrong. So what's the story this year? This chart shows the price (in cents) for a futures contrast that pays out $1 if Obama (blue) or Romney (red) wins. In a nutshell, Romney's toast. And has been toast since, to be honest, around the start of August. If you see a Bubblevision expert tonight telling you next week's debates are a game changer they're wrong. It's game over. So prediction markets exist and I think they work. But that's not what's cool. What's cool (as I found out reading last Friday's FT - yes it takes me that long to write things up) that there are other prediction markets, particularly the one run by Intrade, and they give you different odds on the same event. The latest price on the IEM for an Obama contract is 79.1c, for Romney 20.2c. After this is, give or take rounding errors, a zero sum gain; either Obama wins or Romney wins (or something so bad happens that the election is called off). But on Intrade you can buy a contract on Obama for $7.51 and Romney for $2.54, paying out $10 if your man wins. So you basically have two different markets, making different prices on the same asset! So here's what you have to do! Buy an InTrade contract on Obama for $7.51. When Obama wins you collect $10 on the Intrade contract. Oh and if an act of God occurs and Romney wins you make $10 in the IEM contracts. I make that a guaranteed 4.9% gain (55.2% annualised). Now there's a couple of catches here. Unfortunately IEM imposes a $500 trading limit (it is purely for research purposes after all) so you can't just blow all of grannys inheritance on this one. Plus there is a $5 sign-up fee for the IEM (full details here). Intrade also charges a $4.99 monthly fee (the fee is charged on the 1st of the month, so sign up next Tuesday to minimise your trading costs). But its still $14.45 of free money! Assumes you can get current prices on 2nd November when the next Intrade fee cycle starts. What we have is an lovely example of an inefficient market, where either a lack of liquidity or an inability to quantify value means that an asset is inefficiently priced. What is cute though is that inefficient prices are readily accessible on two separate, consumer-facing markets. That's all. Now go off and watch Bill Clinton's 2012 Convention Speech. Whatever your political views, its a masterclass in how to make a complex, serious argument in a simple and humourous (but sharp-elbowed) manner. And it's great entertainment. That's the point isn't it? Are you so sure now Jonny? lol. 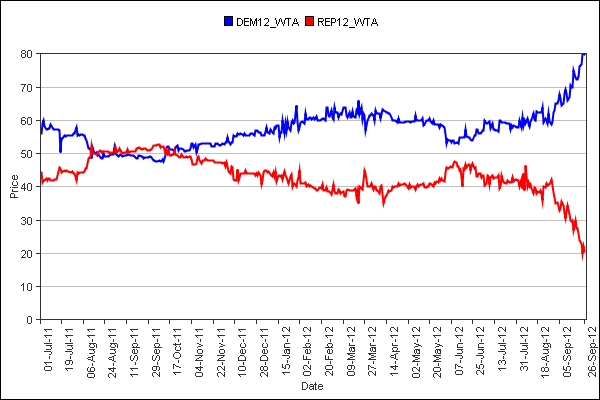 I've been looking at the spreads with much interest over the last fortnight! The bad news is they've come in dramatically. The good news is they still give the big O a 63:37 advantage, i.e. a 70% better chance of winning than Mr R.
The bottom line is that while the press are incentivised to talk up a comeback kid, you'd be surprised at how wide the margin remains despite suffering the incumbent suffering pretty much a "worst case scenario". That's why I love the IEM - it cuts through all the BS. Of course if the slide continues I will continue to worry, but that was the whole point of flagging it when the price was up at 80 - you can actually take a pretty big hit to the price but still be ahead. Would you not make $5200 potentially off Romney winning if you hold 520 contracts and they pay out $10 if he wins? Oh wait, the contract price is a decimal point out for Romney, no? No, no error on the decimal point. The difference is contract sizes - IEM contracts are up to $1 with a 1$ payout if you get it right. Intrade are up to $10 with a $10 payout. Therefore you need to buy 10x as many IEM contracts as Intrade ones to hedge your position.